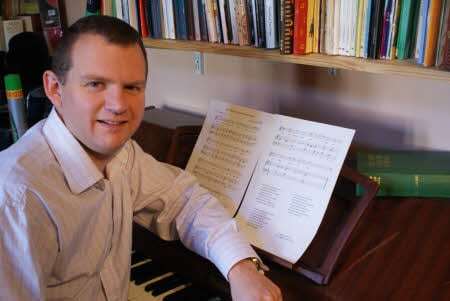 The Royal School of Church Music’s (RSCM’s) annual Dr Harold Smart Composition Competition has been won by David Manners, a Lay Clerk at St George’s Chapel. His setting of a text, How shall we sing salvation’s song, by Bishop Timothy Dudley-Smith is called Llangarron, and was chosen from a record field of 236 entries. In past years entrants to the competition have been asked to write an anthem but this year a hymn tune was the task set in order to mark the 150th anniversary of the publication of the first edition of the hymnbook Hymns Ancient and Modern. David Manners said: “It is a real thrill that the adjudicators chose Llangarron. The tune is named after the place where my Grandmother grew up, and with her passing this year the name seemed appropriate. With such powerful words as inspiration the tune was a joy to write.” The hymn was sung for the first time during Evensong at Southwark Cathedral on Monday 24 October.